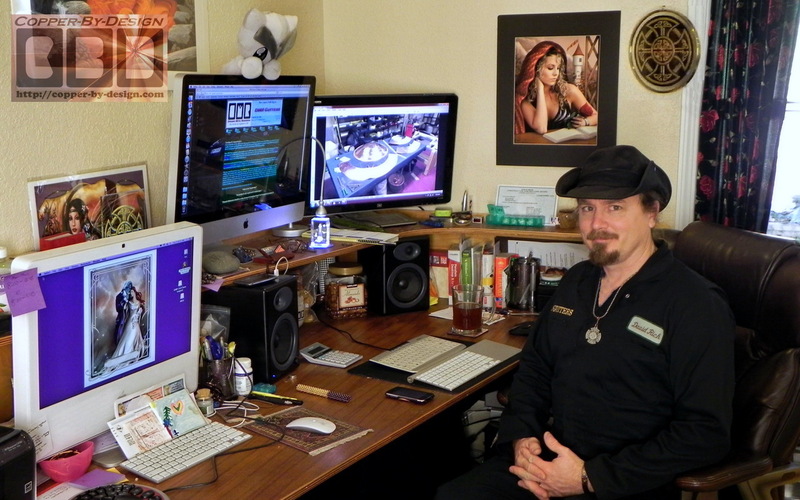 This is me: David Rich at my desk. I normally check e-mail at least twice a day even on weekends, as long as we are not out of town, which is rare. Feel free to call my cell # listed above if you do not hear from me shortly, or just to pick my brain, but it is still very important to get a firm quote in writing. Quality & Service is not expensive -- it's priceless. What Can You Do, or Cannot Do? CBD specializes in designing and personally fabricating the best rain management products you're likely to find at any cost for Clients all across the Nation at a more reasonable cost with a lower overhead than most shops. At least from what I hear from what I've heard from our Clients we are less expensive, yet provide better quality, and more personal service. We have done a variety of other project involving different types of metal, wood, and plastic. Unique design is my strong suit, so I encourage original design projects, where other Shops may not want to bother working out these details with Homeowners. I'm very clever, but my psychic abilities are limited, so please be as specific as possible in your e-mail with details, measurements, along with photos and diagrams you are able to provide. I have to depend on the accuracy of the information you provide through e-mail in order to make your dreams come true with the least amount of complications possible. I will do my best to ask the right questions without trying to up-sell you in the process. I try to keep my focus on your long term satisfaction, and not treat you like you're just made of money. I may ask questions to the point of being annoying at times in an effort to make sure your projects will go on without a hitch, since I may not be able be on site to get measurements for you if you are outside Oregon. 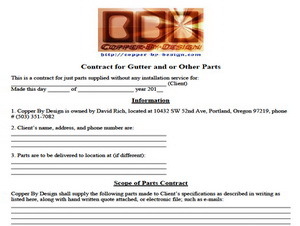 I am an active Oregon Licensed Gutter Contractor since 1993, but not licensed to work outside Oregon, or insured to do roofing related installation work, so even if you happen to be local to us if you are not able to do it yourself you may need to hire a Roofing Contractor to install some of the roofing products CBD builds for you. I will do what I can to make the install as simple as possible. I even supply all the copper, bronze, or stainless steel fasteners along with detailed installation instructions, and I am very reachable by cell phone during the installation if you run into a glitch, so you do not have to wait for me to respond through e-mail. There are several on-line consumer referral web sites to use in order to find good local Roofing Contractors, but you would do well to reference my Roofing Specifications web page beforehand to help interview local Roofing Contactors. I do answer my cell phone personally nearly all hours of the day, but if you are on the East Coast you may want to consider the 3 hour time difference. As you can imagine my Wife does not like it when we are woken up at 4AM by a phone call, and I'm not likely to be at my best at that hour. I had a toll free phone number for several years, but that has became irrelevant these days, so I did away with it back in 2009. I'm happily to talk to you over my cell phone to answer any questions you may have, but I refrain from quoting project over the phone; only because we would not have a written record of it to refer to later on. If I never quote projects over the phone it avoids those potential conflicts. Besides that it often take me hours to work up the careful calculations needed. It is best to have these details with a quote in writing through e-mail, so we both have a written record of what was decided and agreed to, as I deal with a lot of Clients. If you cannot work through e-mail that would make this process very slow and difficult to share photos and diagrams through the Postal Service or texting back and fourth, but I will work with you as swiftly as possible. I am still a hands-on contractor, so I may need to call you back when I am in a better place to talk (down off a 2 story ladder), so in case I'm not able to answer; please leave us your name and phone number, so I can call you back ASAP. Unlike most other site you've seen I post the cost of most projects on this site with freight included for those out of State Clients This is so you are able to anonymously shop around and compare without having to contact me. If you want to delve deeper and ask for a specific cost on a project you are serous about feel free to contact me with details, photos, and diagrams if you can. To e-mail CBD just click on the image near the top of this web page showing my e-mail addy, and it should automatically launch your e-mail program with our e-mail address in place and subject line typed in, which you can personalize. Write us an e-mail with a description of the work needed and perhaps what sort of budget limits you might have, along with any relevant details and digital photos, or diagrams (please scan diagrams in as jpg image file or PDF) that you can provide, along with your contact info and phone# in case we have some question for you, so I can respond with a quote for your consideration ASAP. 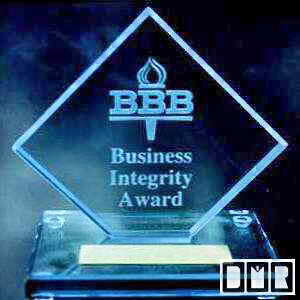 If you are a Contractor bidding a job which is not yet sold I am not here to do your job for you. It wastes too much of my time with the high likelihood you will not get that job, so please keep this in mind before contacting me. Those type of quote will cost you. If you had not divulge this fact I will be sending your a bill for that estimating service once I find out the truth, so no sense hiding this from me. Fortunately these days it seems most everyone has a digital camera on their cell phone and knows how to e-mail pics to friends and family, so this has worked out very well over the last few years. Modern digital cameras take very large photos for better clarity when printing and allow for photo editing, cropping, and resizing. Feel free to send us large photos or diagrams of at least 1920 pixels wide. We have broadband connection, so large image files are not a problem, but it's usually best to keep groups of image files under 5 megs per e-mail, or use dropbox. With larger photos I can zoom in for a better look at your situation, but tiny photos are not nearly as clear to tell your story. For this web site I reduce our photos down to a common monitor resolution size of 1920 pixels wide for a more full screen look. You probably already have a basic photo editing program on your computer. If not: there is a program I like that is a user-friendly image organizer/editor called ACDSee for under $50. They made a Mac version, but it is not nearly as good as their PC version. Can I Fax You Forms or a Diagram? Our printer/scanner is also a fax machine, but we dropped our land lines back in 2003, so it is not connected. I'm trying to do my part to encourage the business community to abandon faxes all together, since they haven't improved or changed that technology much over the last 3 decades. A photo or scanned 'jpg' image file or 'PDF' files are by far much clearer than a fax. We prefer just a standard 'jpg' image file. Don't worry about reducing the image size for a smaller upload file. I like images that are at least 1920 pixels wide to get a decent look on my 42" monitor. If you do still need to fax us a document we have a ph# you can use that will send it over to my Wife's e-mail: 971-216-4999. Be sure to send me an e-mail as well; letting me know to have her forward that to my computer, or I may never see it. I've done plenty of on-site work within a 150 mile radius and I could travel further, but I have to charge for travel time and boarding for job sites outside the Portland, Oregon Metro area. 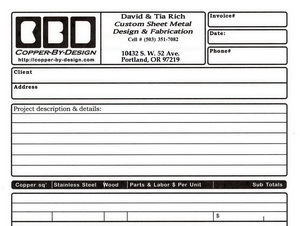 I am not licensed to work outside Oregon, so if you are that far away I cannot help you with the installation. I can often whip out simple flashing orders or gutter part run-outs within a week or so. We should be able to work out a preliminary bid through e-mail, but if you need me to drive out to your house to get measurements I will provide a free detailed estimate as long as you are within 20 miles of Down Town Portland, Oregon. Within a couple work days time I should be able to provide you with a bid. I will try to call you before driving out to the job site, but if you do not hear back from me within 24 hours with a personal e-mail, I may not have received your e-mail for some reason, so call me directly. Most of our custom copper work over the last decade has been for out of State Clients and a few outside the USA. Look over our Latest News web page for an idea of what our current lead-time is for custom copper work. I prefer to handle the details through e-mail, so we both have a written record of these details and price negotiation. That way there should be no chance of a dispute. I assure you that I'm very disciplined to respond swiftly to each Client's e-mail within 24 hours, so this should go relatively quickly, but you are welcome to call to brainstorm ideas with me. Please call me if you had not receive a reply within 24 hours. I can only begin work with receipt of your full payment or the appropriate deposit. For work over $500 I only need a 1/2 deposit, and the rest upon completion. For orders of over $2k just a 1/3 deposit is fine, with the second 1/3 due when I have started on your project and begun to send you progress photos for your approval (as seen on this web site). I will then need the balance before shipping or delivery. To the right is a PDF file invoice form you can print out, fill in, and mail along with your payment to help clarify the details of your project, which could possibly get lost or confused within the dozens of e-mails we may have exchanged. A good contact phone # is necessary for the shipping label, as well as a quick way to reach you if I have a question or run into an unexpected issue. To the right is a link to our PDF file for a general contract form you can print and fill in as well; to make sure your rights are protected. Then E-mail or mail it to me to sign and send back to you the signed copy once we have your payment. I will not be sharing your personal info on the web or with anyone other than just the freight company only for delivery purposes. If for any reason you do not want images of your project associated with your name on our web site let me know and I will be happy to respect your wishes. To date I have not run across any problems from this exposure, but no need to debate this issue with a Client. If you feel confident that we will be able to work out a reasonable contract you can expedite this process by getting CBD's schedule by mailing an approximated initial payment or at least a $200 reservation fee. I am plenty busy, so you are welcome to cancel a project without explanation before CBD has begun fabrication, so your risk in quite minimal. This takes the pressure off of having to make a hasty decision about the details of your project. We will be sure to set a firm ceiling cost before CBD begin fabrication. All but 10% of that reservation fee is refundable if we are not able to work out a suitable arrangement that fits your needs and budget. This is not a ploy to scam $ from people. That 10% charge is only to encourage you to work this out with us, but not so much you feel stuck. I will do my best to provide you with a reasonable quote that meets your need. As stated above, we know life is unpredictable, so if you find the need to cancel a contract for any reason all but 10% of your deposit is refundable without explanation, up until the time I have started to build your project. That 10% fee is not so much you feel stuck with CBD, but just enough to encourage you to try to work this out if possible. If you need to cancel after fabrication has begun please let me know ASAP if you do not want to be obligated to cover the balance due at completion. At that point when I have cut and bent copper for your project the deposit is not refundable, such as the standard policy of most any other custom shop. I will do my best to work around your needs, as I do not want any unhappy Clients. I try to keep in mind a bad review is a scar that cannot be removed by myself. I realize this can be a touchy subject to cover and feel free to ask questions if this has not satisfied your concerns. If there is a reasonable warranty issue your project will be replaced, or all funds paid would be refunded including return freight (if applicable). Although, I cannot guarantee your project will be perfect or just exactly what you had pictured in your mind. (d) be undamaged when it first arrives to your location through the freight company's insurance, unless you sign for it before it has been carefully inspected. Of course we cannot warranty the installation if CBD is not the installer. In the event of an issue arising with a Client being unsatisfied with a project before it ships I will normally bend over backwards to make things right. Fortunately this has only been a problem with one Client (2/08) where we were unable to resolve our differences, and I eventually refunded her full payment w/o any Court action, so it could happen. I cannot cover all possible issues here, but if a Clients aesthetic concerns conflicts with design quality I will not compromise my standards. Even if that Client is fine this would void their warranty. I am not going to keep track of projects that shipped w/o a warranty due to a design conflict, so that would void a contract and 90% of what they paid will be refunded. If you were not to approve the fabrication built by CBD before it ships from evidenced by the photos I share with you, and CBD is not able to satisfy your concerns you can refuse that project and not be obligated for the balance. The deposit may not be refundable at that point, unless I manage to sell that project to another Client, but that may take some time. After you had taken delivery of a project and you are not satisfied it can be returned to be changed or rebuilt from scratch is necessary, or refund the amount paid less the deposit, but CBD may not cover the return freight cost, only because the photos should have been enough to figure out if this would not be acceptable, since we provide better photos than you would get from any other shop. Most of the deposit amount may be refunded if I manage to sell it to another Client, but that may take some time. I trust you will find these policies fair and reasonable, but let me know if you have issue with any of this and we will see if there is some way to work this out to meet your needs. Note: If using a CC for payment is only about speed; then to get your payment to us through Overnight Mail with a check would be cheaper for payments over $500. As to a little history about CC processing fees: for decades CC companies had force all merchants to eat that cost, but a few years ago a class action law suit was finally won over this issue. Although, they still are not willing to add this fee to your transaction, which would be more logical, but would also dissuade their Card-holders; given how they are being double charged for each transaction with this fee, high interest rates, and late fees. They instead put it on us merchants to have to ask for this fee up front (if we dare), while they continue to rake in billions each quarter just for this convenience. Which is upwards of 10X more than what bankers back in Ebenezer Scrooge time was scorned for charging back in the day. If nothing else there should be a cap or sliding scale on how much they can charge for a single transaction. As to a little history about CC processing fees: for decades CC companies had force all merchants to eat that cost, but a few years ago a class action law suit was finally won over this issue. Although, they still are not willing to add this fee to your transaction, which would be more logical, but would also dissuade their Card-holders; given how they are being double charged for each transaction with this fee, high interest rates, and late fees. They instead put it on us merchants to have to ask for this fee up front (if we dare), while they continue to rake in billions each quarter just for this convenience. Which is upwards of 10X more than what bankers back in Ebenezer Scrooge time was scorned for charging back in the day. If nothing else there should be a cap or sliding scale on how much they can charge for a single transaction. Most price examples on this web site show the price those Clients had paid along with the cost of a custom crate and freight included, so you have a more realistic idea of what a project like yours would cost. Our quoted prices for smaller items like roof caps usually include the cost of the custom shipping crate and the delivery through FedEx Ground or Roadrunner LTL within the continental USA. Larger items like chimney caps will have itemized charges listed, and Clients will receive final cost discounts if the unit weighs less than anticipated in the original quote, or the freight cost is less than predicted. You are also welcome to make your own freight arrangements if you can score a better price. We do not mark up the cost of freight, so this make no difference to me. You will need to tell us if you require 2nd day, Express Delivery, or a Foreign export shipment, so I can quote you the price for those very expensive delivery services. It is true how this web site demonstrates I have an extraordinary high ability to problem solve issues, mechanical comprehension, and spatial arrangement, as well as over 20 years experience specializing in rain management products, so I may be able to assist you to evaluate situations better than most experienced Contractors and even Inspectors with perhaps less personal bias. If you have an existing issue or an up-coming issue about construction work I offer a Quality Control Standards Consultation Service for a fee. I'd love to help everyone for free, but in the real world that is simply not possible. I'm still an active Gutter Contractor, where I need to use the daylight hours to get work done in my shop or on site. Then doing bids and paper work at night into the wee hours. That is not counting having a life outside of work (when I am up on a roof may not be the best time to chat for a half an hour complaining about problems caused by some other Contractor 3,000 miles away). Before calling for consultation service I need you to send an e-mail detailing the situation w/digital photos, and your contact information with convenient times to be reached. I will send you a personal e-mail response within 24 hours to arrange the cost and set up a time to go over your issues. Please follow these guide lines, or I will not be able to help you.